Dr. Vanguel Tangarov performs as principal clarinet for the Austin Opera, Mid-Texas Symphony and Victoria Symphony orchestras. Tangarov is an assistant professor of clarinet at Texas State University and an active teacher and clinician in Leander and Round Rock Independent School Districts. He is also artistic director of the Musicartissimo International Master Class Series USA. Mexico. He has appeared as a soloist with the Mid-Texas Symphony in USA; Plovdiv Philharmonic, Rousse Philharmonic, Varna Philharmonic and Sofia Philharmonic orchestras in Bulgaria; Constanta Philharmonic in Romania; and Monterrey Symphony (OSUANL) and Monterrey Chamber Orchestra in Mexico, performing music by Mozart, Weber, Copland, Francaix, Cimarosa, Giampieri, Bernstein and Pipkov. Tangarov has performed in more than 20 countries on three continents, winning positive critical acclaim. Equally popular as a soloist, recitalist and chamber musician, he has performed in important venues worldwide such as Berliner Filharmoniker Hall (Berlin), Gewandhaus (Leipzig), Schauspielhaus (Berlin), Concertgebouw (Amsterdam), Oslo Konserthaus (Norway), Cadogan Hall (London), Symphony Hall Birmingham (UK), Bulgaria Hall (Sofia) and Zaragoza Hall (Spain), to name a few. Tangarov studied clarinet with Dimitar Boyanov at the Dobrin Petkov Music High School for gifted students in his native Bulgaria. He continued his education at the National Academy of Music “Prof. Pancho Vladiguerov,” where he received bachelor of music and master of music degrees under the direction of renowned pedagogue and concert artist, Petko Radev, the former principal clarinet of Teatro Alla Scala di Milan, Italy. Tangarov received his doctor of musical arts degree from The University of Texas at Austin under the direction of Richard MacDowell. He has also received instruction from Aurelian Octav Popa, Rumania and Gerald Pahinger, principal clarinet of Vienna Symphony. Tangarov’s most recent solo appearances include performances at the 2014 International Clarinet Fest in Baton Rouge, Louisiana, as well as a performance at the opening ceremony of the 2014 International Plovdiv Chamber Music Competition in Bulgaria. Tangarov’s performance of Bela Bartok’s Contrasts with the violinist Elmira Darvarova, former concertmaster of the Metropolitan Opera, New York, and Bojidar Noev, former head of the piano department of Innsbruck, Austria, was broadcasted for the Bulgarian National Radio. He can be heard as principal clarinetist on a recent Naxos Label recording titled Circus Maximus by John Corigliano with The University of Texas at Austin Wind Ensemble; Harmonia Mundi Label recording Samuel Barber: An American Romantic; Conspirare, Craig Hella Jonson and The Company of Voices, as well as the soundtrack for the movie Knight of Cups, directed by Terrence Malik, in addition to being on more than 10 other recordings. Tangarov has been recognized and awarded numerous prizes in both national and international clarinet competitions including: Prague Spring International Competition, 1996, 6th place overall; United Nations International Clarinet Competition, Portugal, 1994, 4th place overall; First International Clarinet Competition, Romania, 1993, 2nd prize; “The Music and the Earth” International Chamber Music Competition, Bulgaria, 1993, 3rd prize; Bulgarian National Clarinet Competition for French Music, Bulgaria, 1997, 1st prize; Brahms Academy Competition for Chamber Music, Bulgaria, 1993, 2nd prize; Bulgarian National Radio-Mozart Chamber Music Competition, 1991, clarinet quintet, 1st prize; and Bulgarian National Clarinet Competition, Bulgaria, 1990, 1st prize. 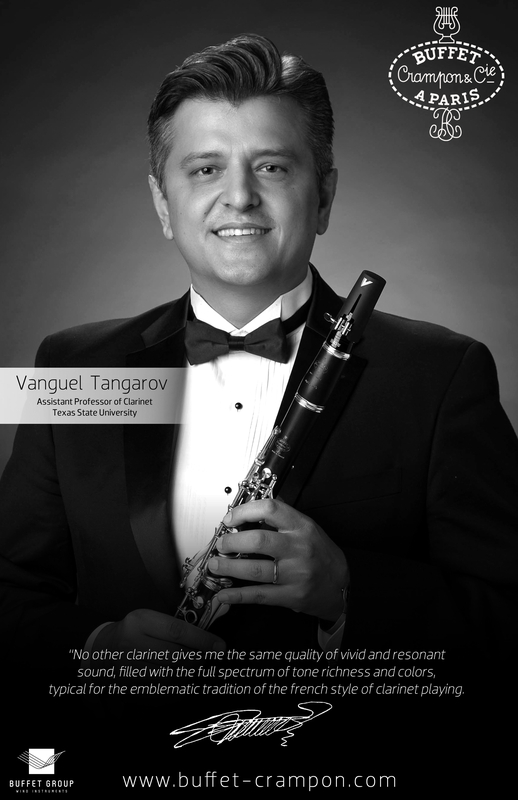 Tangarov is a Buffet Group USA Performing Artist and performs exclusively on Buffet Crampon clarinets.